This is a handwritten letter from Eugene Guagneli to his mother, Luisa Guagneli, while she was interned at Kingston Penitentiary during WWII. It is written with blue ink on lined loose-leaf paper. 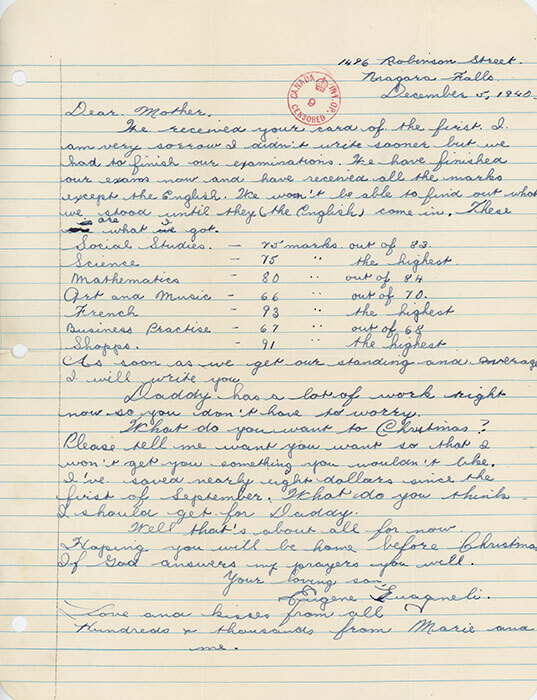 In this letter, Eugene tells his mother of his marks recently received at school; for example in French, he got "the highest" in his class with a 93. He also writes, "Daddy has a lot of work right now so you don't have to worry." Lastly, Eugene tells his mom that he has been saving up for Christmas and asks her what she would like. He signs off: "Your loving son, Eugene Guagneli. Love and Kisses from all. Hundreds + thousands from Marie (his sister) and me." The letter is dated December 5, 1940. Mail correspondence between internees and their families underwent a censorship procedure by the Internment Camps. Luisa Guagneli was one of four women interned during World War II. Her son Eugene and her husband Arturo were designated as enemy aliens.